Rothbard's posthumous masterpiece is the definitive book on the Progressives. It will soon be the must read study of this dreadful time in our past. This is a book that only Murray Rothbard could have written, connecting the dots between the unholy alliance of state intellectuals, big business, and politicians of both parties. The insideous result is the establishment of large industrial cartels, the triumph of institutionalized racism, the growth of government-backed trade unions, and the glorification of military expansion abroad. 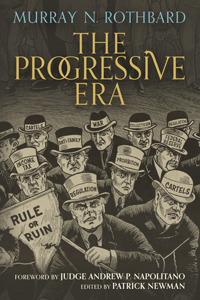 To understand the modern state, you must understand the Progressive Era. For this reason, Rothbard's posthumous masterpiece may be one of the most important books he has ever written. The current relationship between the modern state and the economy has its roots in the Progressive Era. Progressivism brought the triumph of institutionalized racism, the disfranchising of blacks in the South, the cutting off of immigration, the building up of trade unions by the federal government into a tripartite big government, big business, big unions alliance, the glorifying of military virtues and conscription, and a drive for American expansion abroad. In short, the Progressive Era ushered the modern American politico-economic system into being.